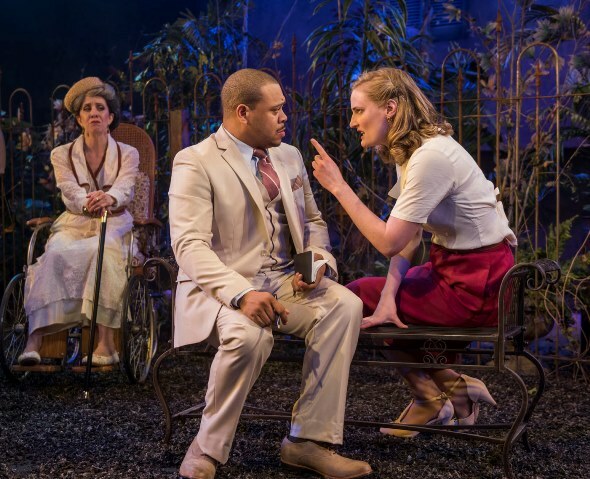 Like Tennessee Williams’ iconic play “The Glass Menagerie,” his later, more concise and certainly more curious “Suddenly, Last Summer” involves the perspective of memory. 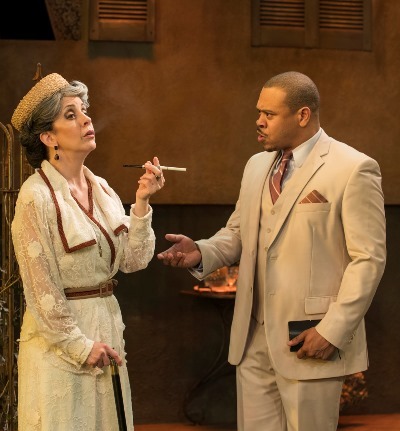 But whereas we take the story-teller’s recollection pretty much at face value in “The Glass Menagerie,” the reliability – indeed, the truthfulness – of memory lies at the horrific heart of “Suddenly, Last Summer,” which now spreads its gothic wings over the stage at Raven Theatre. The central character of “Suddenly, Last Summer” never speaks. He cannot. He is dead. Exactly why Sebastian is dead, how it happened and perhaps why his death was not prevented, is the point of debate between his mother, the wealthy New Orleans widow Mrs. Venable, and her niece Catherine, the man’s traveling companion at the time. Mrs. Venable and her grown son were very close. Sebastian never married and always traveled with his mother. But last summer, when age had finally caught up with the woman and she was no longer able to venture abroad, her son invited Catherine to go with him on holiday to Spain. There, Sebastian died in what Catherine has described, to Mrs. Venable’s great vexation, as a horrible death at the hands of cannibalistic street urchins. To silence Catherine’s grisly, defamatory tale – which also portrays Sebastian as luring beautiful young men and boys into assignations, using the attractive Catherine as bait — Mrs. Venable has prevailed upon a local physician, Dr. Cukrowicz, to perform a lobotomy on her niece in exchange for a generous contribution to the doctor’s research center. The curtain rises on this narrative exposition. The grand dame, beside herself with indignation, has summoned Catherine – in the care of a nurse – from the asylum where she is now incarcerated, still reeling from Sebastian’s death and whatever it was she witnessed last summer in Spain. For all the horrific detail at its core, “Suddenly, Last Summer” displays Williams’ characteristic lyricism, a personal brand of dialogue both lifted and weighted by the air and culture of his native South. While Raven’s production – directed by Jason Gerace with Mary K. Nigohosian as Mrs. Venable and Grayson Heyl as Catherine – neatly frames the conflict between the traumatized witness to Sebastian’s death and the cold determination of his mother to stop her mouth. Yet the humidity and languor of Williams’ language are but faintly suggested. To make a rather fine distinction, the gist and the inescapable fundamental power of the play are there for the observing. But the ineffable part of poetry has not been absorbed into the actors’ skin, into their breath of inflection. That’s not the same thing as speaking with an approximate drawl. Nigohosian’s imperious Mrs. Venable harangues within a rather narrow range of expression, never mind emotion. I heard her words without experiencing the towering anger, dismay, pain behind them. In her eyes, her dear son Sebastian is being slandered by her own niece, whose dereliction has resulted in this tragedy. It’s all lies. She’s sure of that. If only she had been there to take care of him as she always had done, he would still be alive. The last substantial stretch of the play belongs to Catherine, who submits to a truth serum before repeating her lurid account of that fatal day for the doctor. 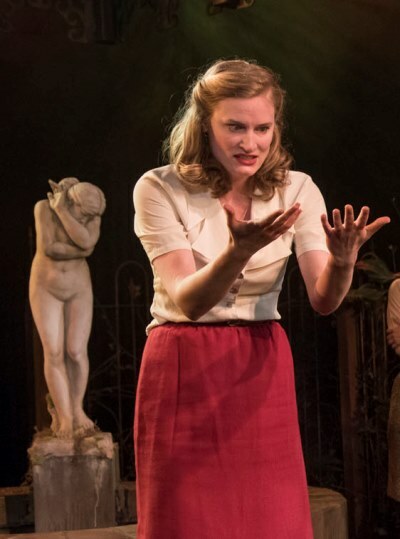 If Heyl’s performance felt both stilted and frenetic early in the show, she brought burning intensity – and wide-eyed truth — to the revival of a memory almost too awful to own. Whether Catherine is accurately recalling what actually happened, whether circumstance and heat and terror tricked her mind: that’s another question. At the performance I saw, Wardell Julius Clark seemed to be reciting his lines as the doctor. 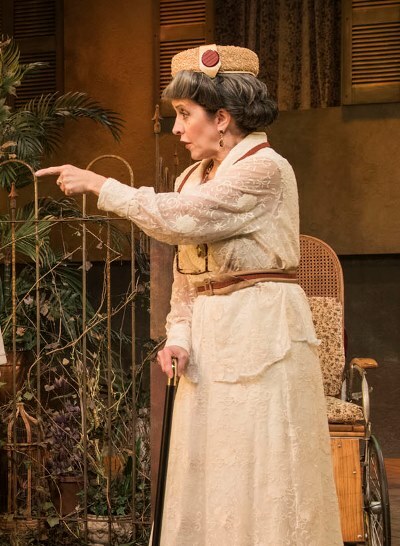 In two ancillary roles, Catherine’s whining brother and her anxious mother, both of whom are dependent on Mrs. Venable’s generosity, neither Andrew Rathgerber nor Ann James managed to summon much presence. Designer Joanna Iwanicka’s garden set works nicely. There’s some poetry in that.